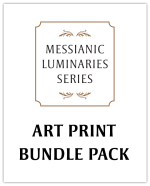 Honor the legacy of Messianic Jewish pioneers with these beautiful 8" x 10" prints for your home, office, or study. Ready for framing or to be displayed as stand-alone prints. The bundle pack includes all prints currently available at a special price. 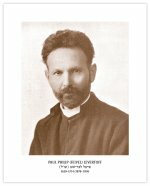 Honor the legacy of Messianic Jewish pioneer Paul Philip Levertoff with this beautiful 8" x 10" print for your home, office, or study. Ready for framing or to be displayed as a stand-alone print. Honor the legacy of Messianic Jewish pioneer Pauline Rose with this beautiful 8" x 10" print for your home, office, or study. Ready for framing or to be displayed as a stand-alone print. 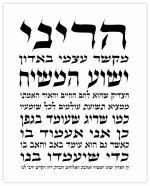 Honor the legacy of Messianic Jewish pioneer Rabbi Isaac Lichtenstein with this beautiful 8" x 10" print for your home, office, or study. Ready for framing or to be displayed as a stand-alone print. 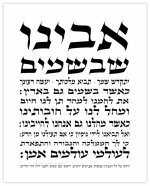 Honor the legacy of Messianic Jewish pioneer Rabbi Yechiel Tzvi Lichtenstein with this beautiful 8" x 10" print for your home, office, or study. Ready for framing or to be displayed as a stand-alone print. 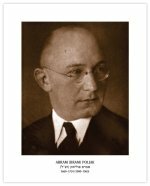 Honor the legacy of Messianic Jewish pioneer Abram Poljak with this beautiful 8" x 10" print for your home, office, or study. Ready for framing or to be displayed as a stand-alone print. 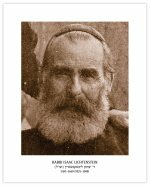 Honor the legacy of Messianic Jewish pioneer Rabbi Daniel Zion with this beautiful 8" x 10" print for your home, office, or study. Ready for framing or to be displayed as a stand-alone print. Honor the legacy of Messianic Jewish pioneer Theophilus Lucky with this beautiful 8" x 10" print for your home, office, or study. Ready for framing or to be displayed as a stand-alone print. In Jewish tradition the sukkah is beautified with a picture of clouds and the statement, “In remembrance of the clouds of glory.” This causes us to remember that the sukkah itself is a reminder of the cloud of the Shekinah that sheltered the children of Israel during their travels in the wilderness. To keep our eyes looking for the return of our Messiah, we have included on this photo the verse, “Behold, he is coming with the clouds” (Revelation 1:7). 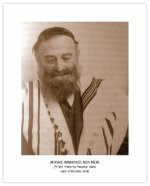 Honor the legacy of Messianic Jewish pioneer Moshe Ben-Meir with this beautiful 8" x 10" print for your home, office, or study. Ready for framing or to be displayed as a stand-alone print. Inspired by these words, Israeli Messianic Jewish artist, Elhanan Ben Avraham, created a stunning piece of art that expands the imagery of "the soul of every living being." We are honored to have partnered with Elhanan to create this beautiful art print entitled, "The Choir." 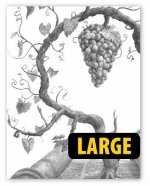 Out of the fertile ground of the Torah, the living vine of David springs forth with wine preserved in its grapes since the creation of the earth. "I am the vine; you are the branches. Whoever abides in me and I in him, he it is that bears much fruit." (John 15:5) Artwork printed on high quality stock, ready for framing. 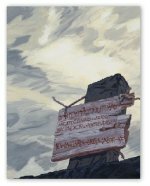 This beautiful print was created from the original acrylic-on-paper painting of Andrew Paquette, used on the cover of the First Fruits book King of the Jews. This lithograph is printed on quality cover stock, ready for framing. 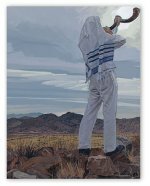 A rabbi blows the shofar over the landscape on Rosh Hashanah. Created from the original acrylic-on-paper painting by Andrew Paquette, this beautiful lithograph is printed on high-quality cover stock, ready for framing.